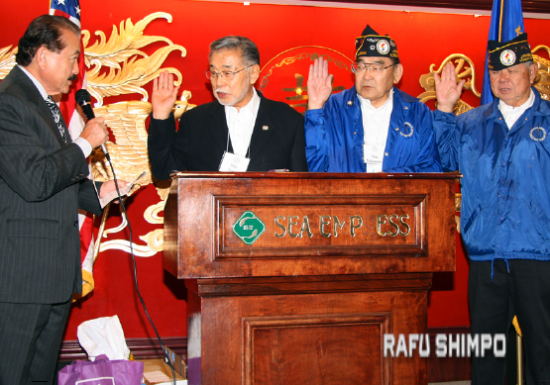 GARDENA — Tohoru Isobe, president, announced that the Japanese American Korean War Veterans (JAKWV) will welcome the new year with a luncheon at the Sea Empress Seafood Restaurant, 1636 W. Redondo Beach Blvd. in Gardena’s Pacific Square, on Saturday, Jan. 16. Reception at 11:30 a.m., lunch at 12:30 p.m. The 2016 New Year’s luncheon will mark the 21st anniversary of JAKWV. Chairman Wally Takata and his committee promise a great event for all attendees. Over the past year, JAKWV has actively participated in memorial services at: the Japanese American National War Memorial Court, located at the Japanese American Cultural and Community Center (JACCC); Evergreen Cemetery; and several other local communities. JAKWV again participated in Nisei Week by providing a Hospitality Room for veterans, widows and families of veterans, and current military personnel. The room was open during the first weekend of Nisei Week and was greatly enjoyed by the many attendees. This year was significant in that it was the hottest in recent memory, as temperatures reached100 degrees, thus creating a high demand for ice water and cold drinks. The food was excellent as always, with the addition of many delicious donated dishes. JAKWV thanks the wives and family members who worked tirelessly to make everything run so smoothly. JAKWV participated in the Nisei Week Parade, with the largest group in a long time. There were 21 behind the JAKWV banner, marching or riding in jeeps, trucks and other carriers. They were very proud to be led again by Korean War Medal of Honor recipient Hershey Miyamura from New Mexico, a charter member of JAKWV and a staunch supporter of all of its activities. At the luncheon, a new board member will be installed: Frank Tanaka, a JAKWV charter member, past president of Veterans of Foreign War Post 4140 (San Fernando Valley), and past Nisei Veterans Coordinating Council member. Guests will include representatives of local veterans groups; Korean Veterans Association (Republic of Korea); representatives from the consulates of the Republic of Korea and Japan; the 2015 Nisei Week Queen and Court; JACCC staff; JAKWV Travel Group members; and friends. Cost: $30 per person. Dress: casual. Make checks payable to JAKWV, attach a list of the attendees (for name tag purposes), and send to Sam Shimoguchi, 12557 Allin St., Los Angeles, CA 90066. For more information, contact Shimoguchi at (310) 433-2847 or [email protected] or Victor Muraoka at (818) 590-6724 or [email protected] Sea Empress can be reached at (310) 538-6868.